How To Clean and Maintain Synthetic Rattan Garden Furniture? Home » How To Clean and Maintain Synthetic Rattan Garden Furniture? The cushion fabric should be cleaned only when necessary, as it will show wear before the rattan itself will. Bringing the cushions inside when not in regular use will also help them to retain their beauty longer, but with modern synthetic fabrics this is much less of an issue than it is with natural fibres or even synthetic fibres of generations past. Some people lengthen the life of their cushions by using a different set to match the style of each season, storing the spring cushions throughout the other seasons, for example, while they cycle through their summer and autumn sets. Natural Rattan is Annoying to Clean – See The Steps Below! Cleaning synthetic rattan is much easier than cleaning natural rattan. To really highlight the difference, consider the recommendations for caring for natural rattan furniture. You should always use a soft cloth or soft-bristled brush to protect the surface of the rattan from abrasion. It should be cleaned at least monthly, though weekly is recommended. A more thorough, annual cleaning is advised as well. Soap can fade the colour of the rattan, so only a small drop in a bucket is recommended as a maximum concentration. Skim the bubbles from the top before use. Make sure to clean the crevices and grooves in the weave – a toothbrush is a useful tool to get hard to reach places. Using furniture polish can enhance and protect the appearance of the rattan fibres. Keep pets and sharp objects away from the surface of the rattan, as it can scratch easily, which can lead to splits and breaks. Keep the furniture indoors. High humidity is good for rattan, but sunlight and frost are not. To remove or reduce staining from spills, wipe with detergent and a cloth immediately. Dry the furniture as soon as possible after any wetting occurs. Use a hair dryer, or some time in the sunshine. It is a good idea to apply a coat of lacquer or shellac after a thorough cleaning as well, to maintain the appearance for longer. To help replace lost moisture from within the core of the strands, boiled linseed oil can be applied. Always use rubber foot protectors on natural rattan furniture, to prevent, splitting, rotting or disintegration of the feet. If wetness or a damp atmosphere has cause warping in your natural rattan or wicker furniture, you can repair it by saturating the warped area with water, and reshaping it. Reshape by using a vice (or tape for smaller, more flexible pieces) to align the warped piece with a straight piece of wood or metal. Make sure it is thoroughly wet and soaked in before bending to conform with the line of the straight edge. You may want to do this in stages, wetting the piece, tightening the vice a little, then waiting for the water to soap in deeper and the fibres to soften. Once aligned to the straight edge, allow it to dry completely, still in the vice, and only remove the vice after all moisture has dried. This process may need to be repeated. If a strand of rattan or wicker breaks, it should be replaced with a new one. Pick up a strand of the right diameter and colour from a DIY store. Carefully cut and remove the broken strand, ensuring that the cutting process doesn’t cause any damage to neighbouring strands. Soak the new strand until it is soft and pliable – this should take about half an hour. Once flexible enough, weave it through to replace the missing strand and tighten it into place. You will also have to glue the ends down. You will probably have to wait for the strands to dry before gluing, and it may be necessary to clamp or otherwise secure the ends in place to prevent movement during the drying process. Once the repair is complete, and everything is thoroughly dry, it might be worth a boiled linseed or furniture polish treatment to get the repair looking like it belongs among the older strands of natural rattan. Now compare that to care and maintenance of synthetic rattan furniture. 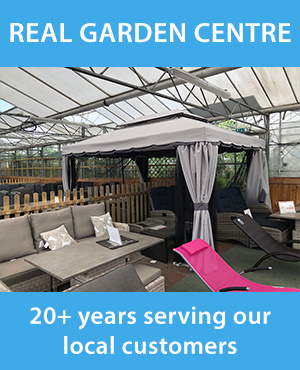 Even though synthetic rattan garden furniture lasts much longer than natural rattan does, and even though it is made to stand up to all-year in the outdoors… everything in the world eventually shows signs of wear and use. You can push back the appearance of wear though regular cleaning, and an annual, thorough cleaning to get into the nooks and crannies and hard-to-reach spots. You can wipe synthetic rattan furniture with a (non-scouring, pH-neutral) detergent to get any tough dirt or grime off of it. How diligent you are in getting into the crevices in the weave is up to you; some hidden dirt in unseen places will harm natural fibres, but not synthetic rattan, so you can have that additional peace of mind. You can then spray the wiped item down with a garden hose – though use of a pressure washer is not recommended, as it can damage the coatings and finishes. If something that stains – like red wine – gets onto your synthetic rattan furniture, it is not a disaster either. Unlike natural rattan, synthetic strands are not porous, so you should be able to wipe or rinse off the substance without it leaving a mark. Your garden party won’t have to stop for a complicated emergency cleaning session, and your furniture will continue looking great. It might be a bit different for some light-coloured fabrics used for the cushions, but even then, most substances can be removed from the fabric with water and washing-up liquid, and most stains can be avoided through quick action. Though the texture of the rattan weave will keep water droplets in place, some time spent in a breezy or sunny area will dry out your furniture quickly after cleaning, and the droplets won’t harm the structure of the fibres anyway. The key is not to let the detergent residue remain on the furniture after cleaning. A thorough rinse is important, as it makes sure that any chemical reaction between the detergent and the synthetic rattan does not continue to occur after cleaning. This will keep your furniture looking better, for longer. A Hoover with a brush attachment is great for loosening and removing dirt and dust from within the weave, and won’t require rinsing or drying afterward. If you find any mould or mildew on your synthetic rattan furniture, there’s no reason to panic. Using hot water with a tiny amount of bleach in it, wipe the affected areas as well as areas surrounding detectable mould or mildew. You can apply the solution to the rattan using a cloth or soft-bristled brush to prevent the combination of the bleach and an abrasive brush doing damage to the surface of the strands. Shaking or gently knocking the furniture piece against the ground will shake free excess water droplets. Leaving it to dry in the direct sunlight in your garden is the best way to finish off the treatment. It is a good idea to keep your rattan furniture in direct sunlight, to prevent it from getting mildew or mould on it in the first place. This seems counter-intuitive, as UV rays can do so much damage to natural rattan furniture, but in the case of high-quality synthetic strands, UV protection has been engineered into each piece, so the otherwise-harmful rays will have less effect, and you won’t be fighting the smell, feel, or discolouration of mould or mildew. 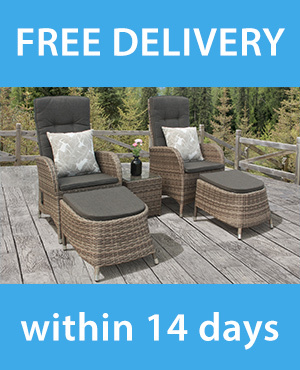 Outdoor furniture has traditionally been very temporary, and has broken down quickly in the elements – both sun and rain. Modern technology has made great strides in providing us with good-looking, comfortable, and durable options to those old-fashioned materials and processes. High-quality, long-lasting, and beautiful furniture – that doesn’t harm the environment – is now available in the form of synthetic rattan garden furniture. Delivered right to your door.